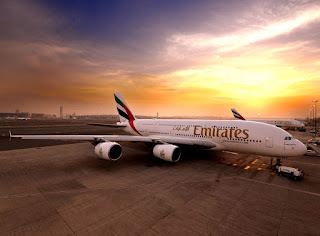 Emirates, the world’s largest international airline, has introduced an additional Airbus A380 service to Johannesburg (O.R. Tambo International Airport), effective 1 December, replacing the previous Boeing 777 aircraft on the route. EK762 (JNB-DXB) and EK761 (DXB-JNB) are now served by the flagship A380 aircraft. This change in aircraft supports growing demand in South Africa, a 14% increase in seat capacity will be as a direct result of the deployment of the second A380 to Johannesburg. The Emirates Airbus A380 aircraft serving the Dubai-Johannesburg route will offer a total of 519 seats in a three-class configuration, with 429 spacious seats in Economy Class, 76 fully flat-bed seats in Business Class and 14 First Class Private Suites. Upcoming festive season travel between the two global transit hubs is expected to be especially strong, building on over 700,000 customers who flew with the airline before November. With Emirates, customers from Johannesburg can enjoy a seamless A380 experience to their most popular destinations via Dubai, including London, Moscow, New York and Bangkok. All four daily Emirates flights between Johannesburg and Dubai operate as codeshare flights with partner South African Airways. Emirates operates the world’s largest fleet of Airbus A380s, with 107 of the aircraft currently in service and 55 pending delivery in this, the tenth year of Emirates’ A380 operations. The deployment of the double-decker aircraft on routes to and from South Africa gives even more regional travellers the chance to experience the aircraft’s industry-leading comforts. These include private suites and Shower Spas in its First Class cabin, while Business Class customers can enjoy the popular onboard lounge and lie-flat beds. Emirates has a long-standing relationship with South Africa in multiple capacities. The African nation ranks among the top five countries for Emirates pilots, and there are over 500 South Africans working as cabin crew on the airline’s flights, extending the nation’s famous hospitality to customers worldwide. Flights to and from South Africa cater to the needs, interests and taste buds of local passengers and cosmopolitan travellers alike. Emirates’ destination-inspired menus allow guests on South African routes to savour the tastes of regional speciality dishes such as newly-introduced Rooibos-cured salmon, ostrich tartare and mossbolletjies bread. Emirates’ award-winning entertainment system, ice, offers up to 3,500 channels of audio and visual entertainment on all flights. A carefully considered local inspired variety of content, Africa on a Plate: Cape Town, movies in local languages for example Afrikaans, and a selection of South African musicians are also available to enjoy en-route. 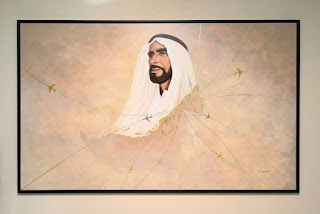 Earlier this week His Highness Sheikh Ahmed bin Saeed Al Maktoum, Chairman and Chief Executive Emirates Airline & Group today unveiled a specially commissioned art piece named ‘From the Heart of Zayed’. The art piece, designed and created by Elygraf, a Filipino artist based in Dubai, was commissioned by Emirates Group to pay homage and celebrate the legacy of the late HH Sheikh Zayed bin Sultan Al Nahyan, the founding father of the United Arab Emirates who continues to inspire present and future generations. The artwork will be on permanent display in the atrium at Emirates Group Headquarters and is part of a number of initiatives done this year to celebrate the ‘Year of Zayed’.